We’re committed to developing fun, innovative, high quality products for children of all ages. *1pc Dumper(3.6” x 2.6” x 2.8”), rotating car hopper can discharge the building materials conveniently. *1pc Bulldozer(8.3” x 2.6” x 3.2”), the arm of the bulldozer can move up and down, each joint of it can move flexibly to form differently. 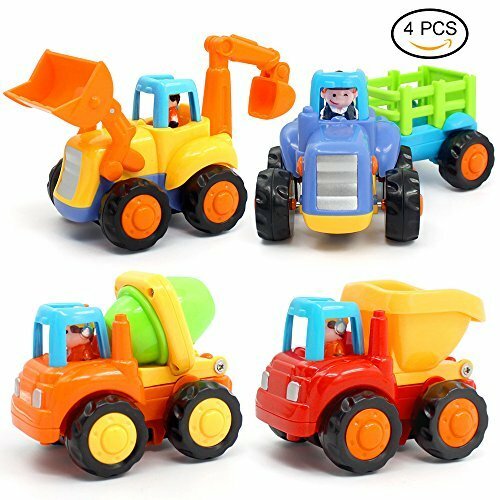 *1pc Tractor with a detachable trailer(6.5” x 2.6” x 2.8”), Fun cartoon driver will amuse your baby, the carriage can be jointed to the main body to carry small items, and the rear door can be opened or closed exercising the flexibility of baby’s hands. *1pc Cement mixer(3.6” x 2.6” x 2.8”), The mixer can rotate up and down and discharge the cement, letting kids know the principle of mechanical automation, cultivating their creativity and manipulative ability. 4-WD system: all trucks runs on push-and-go power. Just hold the truck, push it forward several times, then let go and watch it roll.Push slightly, Go faster than other sellers. Baby after 18 months old is sensitive about small things and focuses on observation. Besides, they can remember the difference between subtle things. For example, to distinguish the difference of car models, car emblems and clothes pattern. All trucks runs on push-and-go power. Just hold the truck, push it forward several times, then let go and watch it roll. Any kid who loves trucks will love this sets. Let’s enjoy Limited childhood time with our lovely boys & girls at once!